The shortlisted filmmaking teams for 2016-17 have been selected, and are now in the training and development phase. The selected films this year represent perhaps the most diverse shortlist yet for the scheme, both in terms of the films’ themselves and the filmmakers behind them, with three quarters of the projects helmed by a female director and half of the teams featuring a filmmaker from a black, Asian or minority ethnic background. Twelve feature films have been previously commissioned through the Microwave scheme, of which eight have been produced and released, and four are currently in pre-production. Two have been commissioned through Microwave International. Emotional anorexia drama Sick(er) and crime morality tale Looted were the films commissioned from the 2015-16 development slate. Dystopian chase thriller Zero and psychological horror The Visitor were the films commissioned from the 2014-15 development slate. Of the original eight features produced through the scheme, many have gone on to receive critical recognition both in the UK and internationally, as well as gaining numerous awards and nominations. 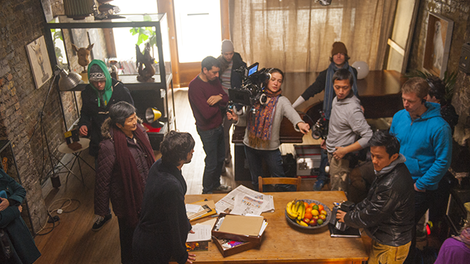 Our most recent release, Lilting, was winner of the Cinematography Award (World Cinema - Dramatic) following its world premiere as the opening film at the 2014 Sundance Film Festival before going on to be nominated for Outstanding Debut by a British Writer, Director or Producer at the BAFTA Awards, as well as Best Achievement in Production and Douglas Hickox Awards at the British Independent Film Awards (BIFA). iLL Manors was winner of the Coup de Coeur and Best Cinematography awards at the 2013 Dinard British Film Festival, and was nominated for three British Independent Film Awards along with Breakthrough British Filmmaker at London Critics Circle Film Awards. Shifty was nominated for the 2010 BAFTA award for 'Outstanding Debut by a British Writer, Director, or Producer', and 'Best Achievement in Production' and 'Best Technical Achievement' at the British Independent Film Awards, as well as winning 'Best Screenplay' at Stockholm Film Festival, 'Best Feature Film Screenplay (Newcomer)' at the Writers' Guild of Great Britain awards, and the Geneva Cinéma Tout Ecran 'Best Actor' award.